Fix Handbrake Distorted Video When Ripping DVD on Windows 10/8/7 with Best Handbrake Alternative. Q 1: "Hey guys, I use Handbrake to rip a DVD, I'm getting distorted video when converting DVD to mp4. Help?" Q 2: "I was using HandBrake to rip The Revenant movie DVD to my PC hard drive, as a test to decide whether I can use it to rip the rest of my small DVD collection. But when I got back from dinner and found that all of the episodes of the ripped video were horribly distorted. How do I fix this or some better software to use?" Handbrake distorted video when using it to rip DVD? How to fix it? Looking for the quickest way to get MP4/AVI video from DVD? Any suggestion of top Handbrake alternatives which can rip DVD to digital fast and smoothly while exporting highest video quality? If you meet the problem of Handbrake outputs a scrambled looking video when ripping DVD, here's how to fix it. WinX DVD Ripper Platinum - [100% clean program] Best DVD ripping software fully compatible with Windows 10/8/7, enables you to decrypt and rip any (protected) DVD to MP4, H.264, MKV, HEVC/H.265, AVI, WMV, MOV, FLV, etc. at one go. Very fast and smooth. 1. DVDs are always encrypted with CSS (Content Scrambling System) or other copy protections like Sony ARccOS, UOPs, RCE, Disney X-project, etc., and Handbrake doesn't support decrypting DVD and can't rip copy protected DVD on its own. Users need to install a third-party DVD ripper like VLC to remove the copy protections from DVD first. So if you use Handbrake to rip DVD, please make sure you've installed VLC as well. 2. If Handbrake distorted video when ripping DVD, you may update VLC. Please be aware that VLC 2.0 changes the code libraries it uses for decrypting DVD, which may also lead you can't rip DVD with Handbrake. The solution is simple. Download and install the latest version of VLC and libdvdcss package, and this may help you solve the Handbrake pixelated video issue. 3. Handbrake can't rip DVD with 99 titles. Another reason of Handbrake outputting blocky or broken up video is it may select the wrong DVD main title to convert. A smarter DVD ripper which can auto detect the right main DVD title for you can easily solve the problem. 5. Other limits of using Handbrake to rip DVD include: Handbrake only provides two codecs: H.264 and MPEG4, and its output video formats only have MP4 and MKV. Instead of being troubled with why Handbrake distorted video when ripping DVD, why not try some best Handbrake alternatives for Windows (10) which can do a far better job as for ripping copy protected DVD on Windows 10/8/7. This article introduces one of them. To solve Handbrake distorted video problem, you may turn to some best Handbrake alternatives. There are a lot of DVD ripping programs for Windows (10) and Mac out there. Many of them can do a great job of ripping DVD to MP4, MKV, AVI, etc., and the most powerful one would be the popular WinX DVD Ripper Platinum which is well-received by many users. This all-in-one DVD ripper for Windows (10) enjoys a high reputation of smoothly ripping any copy-protected DVD (incl. latest Disney DVD) to MP4, MKV, AVI, WMV, MOV, FLV and hundreds of video/audio files and 350+ device profiles (iPhone XS, Galaxy S9, etc. ), by accessing all DVD protections like CSS encryption, region code, Sony ARccOS, UOPs, RCE, Disney X-project, etc. Thanks to its built-in Nvidia/Intel/AMD hardware acceleration engine, Multi-core CPU (utmost 8) and High Quality Engine, it delivers a superfast DVD conversion speed and outputs highest video quality. Safe Mode is also available to ensure users a smooth DVD ripping process when ripping any encrypted DVD. Besides, this top Windows (10) DVD ripper also equips many DVD editing options like trimming, cropping, expanding, adding subtitles, as well as allows users to set video/audio parameters incl. changing video resolution, frame rate, aspect ratio, etc. Free download, install WinX DVD Ripper Platinum on your Windows (10) PC or Mac (Mojave) (free download Mac version). Step 1: Import the DVD disc. Insert the DVD disc to the DVD-ROM, and click "DVD Disc" button on the top-left of the best DVD ripping software. This smart DVD ripper can auto detect the right DVD main title for you, which Handbrake and many other similar DVD ripping programs can't do. Step 2: Select the output. Edit and adjust the video parameters freely. Select the output video format in the pop-up Output Profile window according to your own needs. Click "Edit" icon to trim, crop, expand, or add external subtitles for the video. Click the wheel-like icon to adjust video/audio settings, like setting video/audio codec, changing the video resolution, frame rate, bit rate, aspect ratio, channels, etc. Step 3: Start ripping DVD with the best Handbrake alternative on Win 10. Click "Browse" to set a destination folder to save the ripped DVD movie video. The top best 3 DVD rippers for disc to digital conversion on Windows 10, 8, 7(32 & 64 bit), Mac, Linux, etc. 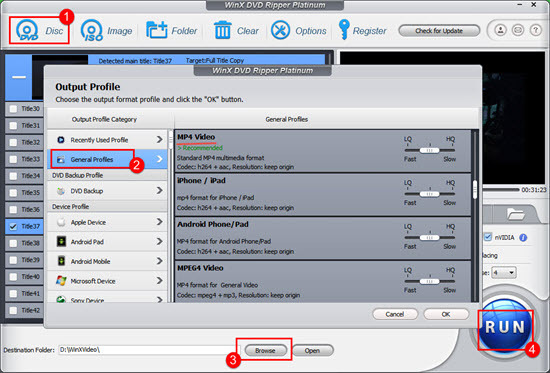 2019 top 3 DVD ripper to rip DVD movie to MP4, H.265, AVI, MOV, iPhone XS/8, Android, etc. on Windows or macOS Mojave. Reasons and solutions to fix Handbrake not encoding full movie. 5 tips to solve Handbrake encode a part of file, Handbrake encoding stop early, Handbrake not ripping entire DVD movie issues. Best Handbrake alternative is also provided..